62 13/16 by 94 3/8 by 4 in. 159.5 by 239.7 by 10.2 cm. 62 1/2 by 94 1/2 by 4 in. 158.8 by 240 by 10.2 cm. 62 3/4 by 94 3/8 by 4 in. 159.4 by 239.7 by 10.2 cm. Mitchell-Innes & Nash is pleased to announce the gallery’s first exhibition with the Estate of General Idea (1969-1994) titled Ziggurat. The exhibition will be on view in our Chelsea gallery from November 30, 2017 through January 13, 2018 and will feature approximately seven ziggurat paintings alongside works on paper, photographs and ephemera that expand upon the significance of the ziggurat form in the oeuvre of General Idea. 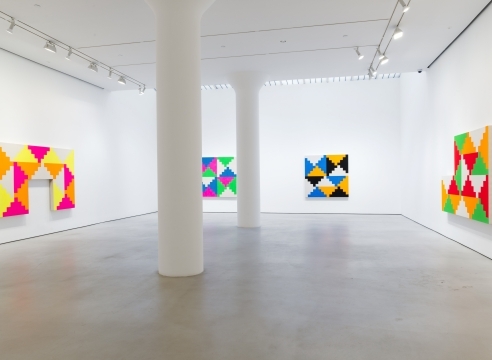 Ziggurat marks General Idea’s first solo exhibition in New York since The Museum of Modern Art presented One Day of AZT / One Year of AZT (1991) in Projects 56: General Idea (1996-97). The exhibition will be accompanied by a fully illustrated catalogue with an interview between AA Bronson and Hans Ulrich Obrist. Please join us for an opening reception on Thursday, November 30 from 6 to 8 pm. Formed in Toronto in 1969 by AA Bronson, Felix Partz and Jorge Zontal, General Idea is internationally recognized for work that tackled such subjects as the myth of the artist, the role of mass media, the relationship between the body and identity, issues of gender and sexual representation, and famously HIV/AIDS activism at a time when talking about the disease was taboo. 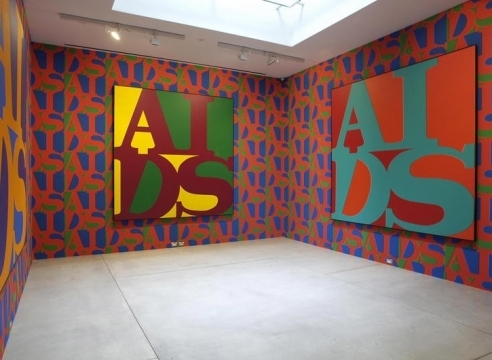 The members of General Idea were key figures in the 1970’s-80’s conceptual art scenes and, with equal parts humor and criticality, created work across a variety of media and platforms. In performances, editions, videos, publications such as their seminal FILE Megazine, sculptures, paintings and installations, the group often occupied unconventional forms of presentation such as beauty pageants, picture magazines, television talk shows, pop-up shops, and various advertising formats. 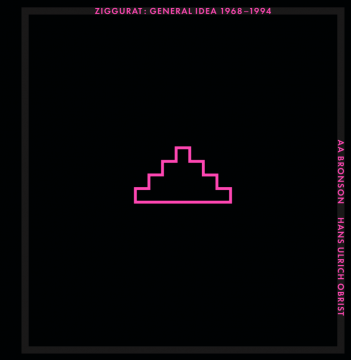 The importance of the ziggurat to General Idea’s practice cannot be understated. It is a central and repeated symbol in General Idea’s vocabulary, appearing (either implicitly or explicitly) in paintings, drawings, performances, photographs, sculptures, prints, videos and costumes spanning the group’s existence. An ancient Mesopotamian architectural structure of steps leading up to a temple, the ziggurat symbolizes as a link between humans and the gods. The symbol can be found in cultures ranging from Mesopotamia to the Aztec to Navajo Nation. General Idea appropriates this symbol of power and theism, utilizing the form as a framing device to examine questions of branding, architecture and spatial politics. The ziggurat for General Idea stands, among other things, as an architectural device communicating fame, money, power and success. The culmination of General Idea’s architectural pursuits would be The 1984 Miss General Idea Pavillion, a fictional structure which purportedly housed The 1984 Miss General Idea Pageant. The Pavillion, as the story goes, burned down in 1984, leaving just a bare ziggurat-shaped foundation of the actual-size floor plan of The Pavillion’s audience seating area. 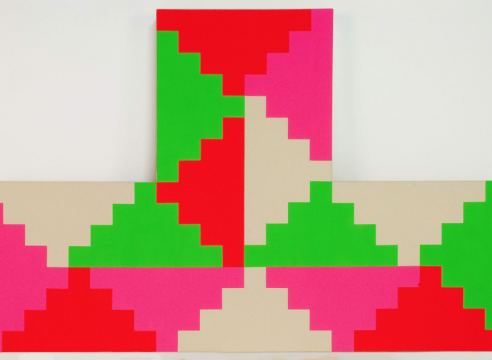 Felix Partz created the first series of Ziggurat paintings in 1968-69 before the inception of the General Idea group-identity and they were later absorbed into the General Idea oeuvre. In 1986, General Idea returned to ziggurat paintings, carrying out sketches from 1968-69 that had never been completed. The later paintings are four-inches deep, which corresponds to the height of each step on the ziggurats depicted, creating a strong object-quality. Several architectural drawings on view in the exhibition situate the ziggurat form within imagined space. Silver gelatin prints depict the VB Gown (1975), Miss General Idea’s venetian blind dress that incorporates a ziggurat pattern and for General Idea represents an architectural massing study for The 1984 Miss General Idea Pavillion. 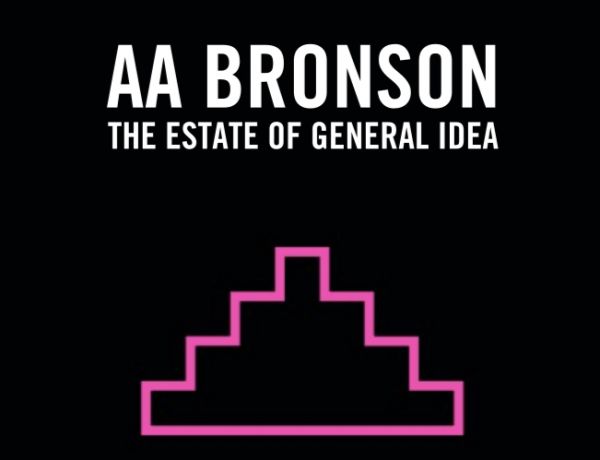 Please join Art Metropole for a book launch and signing with AA Bronson of The Estate of General Idea on Wednesday, March 28 from 7 to 9 pm at the Gladstone Hotel, Toronto. 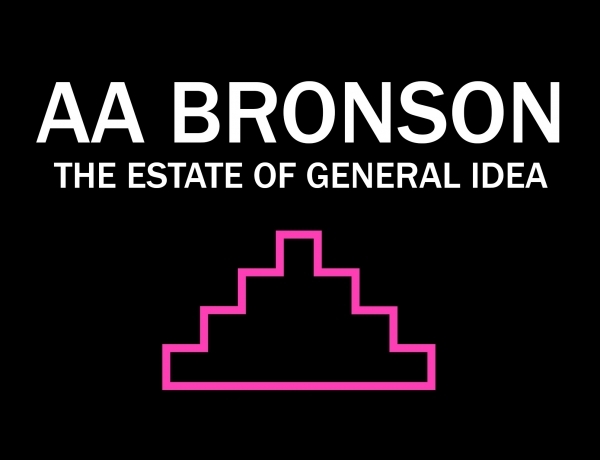 Please join us for a special talk and book signing with AA Bronson of The Estate of General Idea on Saturday, March 10 at 4 pm. Kindly RSVP to rsvp@miandn.com as space is limited. 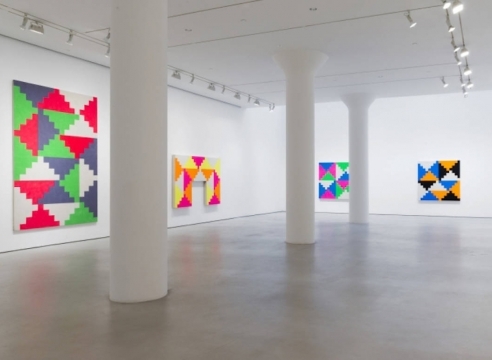 This show introduces viewers to the group's less well-known paintings: hard-edged, fluorescent geometric abstractions that evoke the pixelated silhouettes of eight-bit video games. They also allude to the mystical and political significance of stepped architecture in ancient societies, from Mesopotamia to the Mayans, where such structures were thought to lead to the gods. Exhibited alongside the paintings are plans for the "The 1984 Miss General Idea Pavilion," an absurdist beauty-pageant venue that, per the artists' lore, had burned to the ground, leaving only the footprint of the ziggurat. "The Estate of General Idea: Ziggurat"
The real surprise of the show is a series of paintings in the main gallery. Covered in allover patterns of interlocking ziggurats, two rectangular compositions from 1968–69 neatly combine stain painting with systemic minimalism. 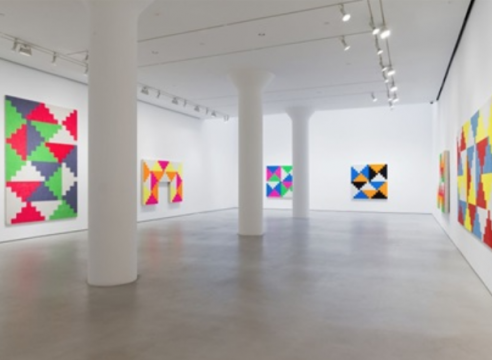 Nearly textbook examples of avant-garde abstract painting concerns of their day, these canvases split the difference between seriousness and burlesque. 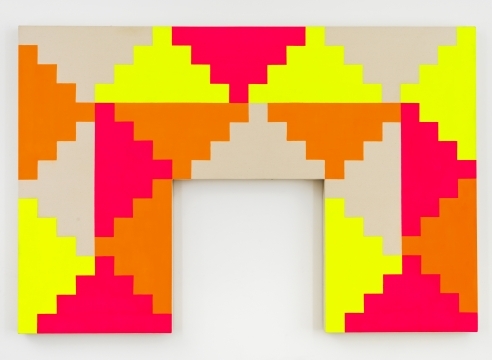 Canadian art collective General Idea (1969–1994), made up of Felix Partz, Jorge Zontal, and AA Bronson, gets its first solo show at Mitchell-Innes & Nash. The exhibition highlights their use of the ziggurat motif, an architectural form common to both the ancient civilizations of Mesopotamia and Mesoamerica and to modern skyscrapers. Formed in Toronto in 1969 by AA Bronson, Felix Partz and Jorge Zontal, the artist collective General Idea built its body of work on a strikingly diverse array of themes, constantly revisiting both the field of contemporary art production and the identity politics of the era that ultimately underscores so much of the artist’s act of world-making, critique and expression. No subject was safe from their intuitive and enigmatic lens, from the myth of the artist, the role of mass media, and the relationship between the body and identity, to questions of gender and sexual representation, and perhaps most famously, the HIV/AIDS activism of the 1980’s, a mode of critique that the group were pioneers of during an era of intense repression and governmental silence. Working in a broad range of practices, from paintings to performances, published editions to video, sculpture to installation, the group was almost constantly in a state of reinvention, speaking to the diversity and power of their collective vision. 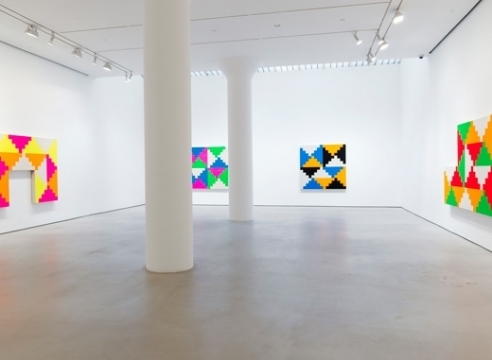 The Estate of General Idea (1969-1994) had their first exhibition with the Mitchell-Innes & Nash Gallery on view in Chelsea through January 13, featuring several “ziggurat” paintings from the late 1960s, alongside works on paper, photographs and ephemera that highlight the central importance of the ziggurat form in the rich practice of General Idea. Known for their unique approach to things and their meaning, General Idea appropriated the ziggurat as the icon of power and theism, utilizing its form as a framing device to examine questions of architecture, branding and spatial politics. For them, the ziggurat stands, among other things, as an architectural device which communicates fame, money, success. The first series of Ziggurat paintings were created in 1968-69 by Felix Partz, but the group didn’t return to them until 1986, completing the sketches from the previous period that were never completed. The exhibition will be accompanied by a fully illustrated catalog with an interview between AA Bronson and Hans Ulrich Obrist. Formed in Toronto in 1969 by AA Bronson, Felix Partz and Jorge Zontal, General Idea is recognized internationally for work that concerns subjects as the myth of the artist, the relationship between the body and identity, the role of mass media, issues of gender and sexual representation, and famously HIV/AIDS activism at a time when even talking about it was a taboo. 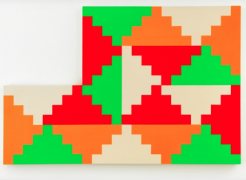 This summer and autumn, General Idea has posthumous exhibitions at MAMCO, Geneva’s museum of contemporary art, and Mitchell-Innes & Nash in New York. 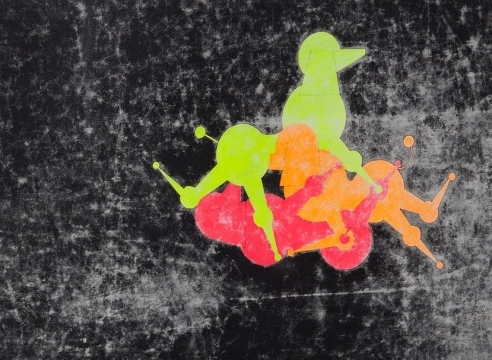 Next spring, Esther Schipper and KW Institute for Contemporary Art in Berlin will showcase works by Bronson and his collective, as well those created under his pseudonym ‘JX Williams’. Outside of the gallery and institutional sphere, Bronson is compiling the group’s catalogue raisonné with Fern Bayer and developing a performance project at the Siksika Nation Aboriginal reserve in Canada.